The Authentic Grape Tomato bursts with juicy sweetness. They are so delectable, kids eat them by the handful. And they are so popular, discerning shoppers ask for them by name. That’s because our Authentic Grape Tomatoes power favorite recipes to new greatness (see ideas here). 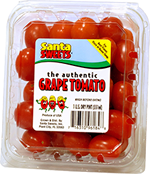 Santa Sweets’ Authentic Grape Tomatoes are ripened on the vine and handpicked to ensure the highest quality. Santa Sweets was the first company to market grape tomatoes in the United States, so we know a thing or two about tomatoes. And our fully integrated farming, packing, and distribution system guarantees you a year round supply of farm-fresh, naturally-grown, delicious tomatoes. 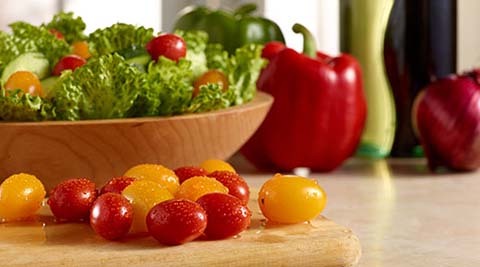 Add some color to your salad with our Golden Grape Tomatoes. Similar in size and shape to our Authentic Grape Tomatoes, these colorful bite-sized tomatoes can be enjoyed as a healthy snack or halved and added to your favorite sandwich. Santa Sweets Golden Grape Tomatoes are a good source of Vitamin C.
Cholesterol and fat free. 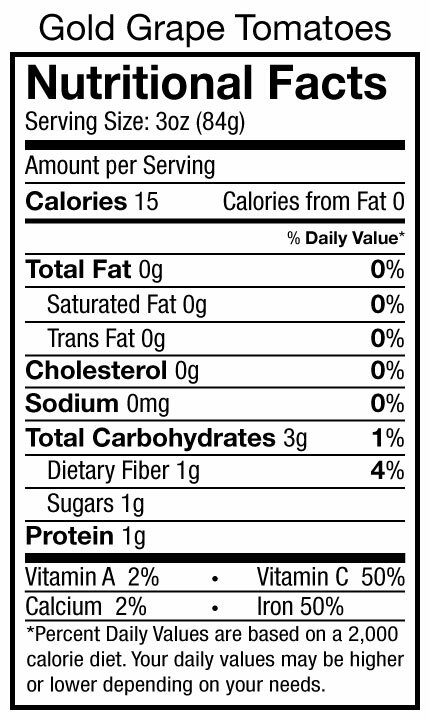 Low in calories. High in Vitamin C. Good source of Vitamin A and contains potassium.